Wigtown & Bladnoch FC's press officer is 16-year-old Martin Flannighan. Right from the moment he returned a phone call while on the school bus home, his efficiency and passion for the Red & White Army was clear. "Miraculous" was Flannighan's response to news that the BBC were paying attention to Wigtown & Bladnoch's Scottish Cup second preliminary round tie against Hawick Royal Albert at Trammondford Park. 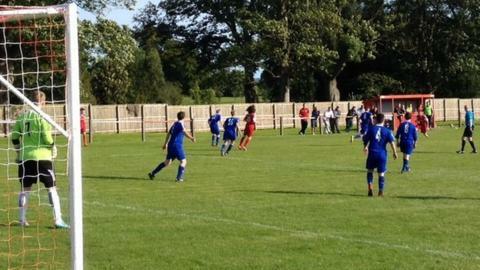 The beautiful, sun-kissed Wigtown surroundings at this footballing outpost certainly had to be seen to be believed. "It's just fields all around," summed up the Douglas Ewart High School pupil before supplementing his understatement with "it's quaint". His dad is club photographer and Martin has officially been media man there since the start of the season. "Facebook, Twitter, club website, match programmes - it's a good bit of fun," added Flannigan, smartly dressed in club tie. "The teams in our league are all pretty easy to get a hold of, so usually it only takes me a couple of hours to make the programmes. The school are very accommodating with things like that." Wigtown is famously Scotland's book town and off the back of Flannighan's subsequent tour of Trammondford Park, there were enough anecdotes and characters to write a short story. Take Debbie, whose game-day role is preparing the half-time pies. "I've got 40 of them," she explained cheerfully. "It's a wee bit more than we would be in the habit of getting. "I love my club and would do anything I can to help. It's my home town, it's local lads and a great community spirit - I wouldn't be anywhere else on a Saturday afternoon." Next to cross our path was Jonathan 'Jona' McQuaker - road worker for Dumfries & Galloway Council during the week; Wigtown & Bladnoch physio at weekends. The 32-year-old sarcastically revealed in the match-day programme that a "Vauxhall Insignia" was his dream car, but now he was bringing more serious news. "Our first choice goalkeeper Chunky has got a grade three tear in his right thigh," he reports. As Jona went off to put back-up 'keeper Wullie White through his paces, 13-year-old Robert Jamieson tested his pal Scott with some shots in an area of grass beside the pitch. "My dad plays for Wigtown," said the Real Madrid strip-wearing lad. "Every week I go to training and I like going to games. The club's in a good shape just now and my ambition is to play for them." A trip to a recently deposited Portakabin unearthed another couple of the South of Scotland League champions' biggest fans, but ones at a higher end of the age spectrum. Secretary Jim McColm, flanked by a group of Hawick Royal Albert officials, underlined how "very special" a day this was - one of the "season's highlights" - before pointing out honorary club president Harry Drysdale. This elderly fellow sipped on a pre-match beverage of the stronger variety, imparting that he had been a Wigtown & Bladnoch supporter and committee member for 50 years-plus. Drysdale's fondest memory was the Red & White Army's admirable Scottish Cup run in 1952, when they knocked out Montrose before losing 7-1 to the mighty Dundee at Trammondford Park. Heady days. For Billy Cluckie, however, this day would be an emotional one - his last match as chairman. Organising Sorbie-based piper Andrew Grimes to play the teams out pre-match was one of his final, thoughtful touches. "I've started a new job and it entails being away from home Monday to Friday," he explained. The chairman's job is a full-time role. You've got to be available to do the necessary for the club and that takes a lot of time and effort. I just don't have that sort of time now." Another full-time role is that of being mum. Maggie McIntyre leaned on the fence pitch-side as her husband helped with goalkeeper coaching and her son Lewis - Wigtown & Bladnoch's left-back - went through his warm-up. "Everyone's involved!" she smiled. "We've been following Lewis playing football since he was four and it's been part of growing up that we just go everywhere with him." Lewis McIntyre scored a fantastic top-corner header in a sore 3-2 home defeat for Wigtown & Bladnoch, a loss that loyal fan and former player Andy Steel put down to a team that had settled all season. "Last week the manager Mickey Dougan was the 12th man," said Steel, who once played against former Hawick Royal Albert player-manager Jim Jefferies in 1976. Incoming chairman Roger Doherty struggled to hide the disappointment of a Scottish Cup exit as he de-rigged the netting from a goal frame. "We just didn't get going today," he sighed. "You only get one chance and we blew it. "Not to worry. 'Moving forward to achieve our goal' is our motto. So roll on next week and we'll get back in the road." Fresh from telling his players they would be rewarded with a £250 night out kitty, Hawick Royal Albert chairman Jim Borthwick could not recall his own club's motto, but he was soon helped by Barry Campbell. "It's 'make it happen'," said the football operations manager. "You've got to go and do it yourself. That's what the boys believe in and they are demonstrating that." Indeed. There was just one lingering disappointment on leaving Trammondford Park a few minutes later; not getting to speak to Wigtown & Bladnoch's former treasurer. He's called Herbie Shingleston. What a great name.